The Church Fund Raising Campaign, launched March 15th is ending May 15th – Has your church started fundraising? 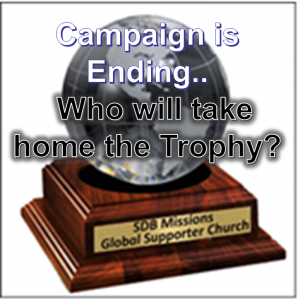 The church raising most funds takes the MISSIONS GLOBAL SUPPORTER AWARD and will be recognized at General Conference. 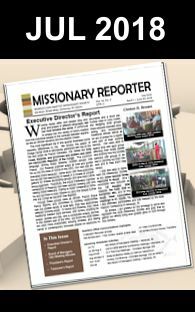 Each church was asked to raise a minimum of $1,000 for missions. To date, we have received $5,475, just approximately 14% of the projected target to raise $40,000. Special thanks to fundraisers and contributors! Who will win the award this year? The 1st Hopkinton SDB Church, Ashaway, RI is in the lead so far. However, your church could still be the winner of the award. Perhaps your church hasn’t met its goal as yet or you haven’t started fundraising. This is your opportunity for another week to generate financial support, to help shore up the Society’s capital fund that helps with office expenses and transportation costs for staff travel to preach, teach & work out the specifics of projects with SDB ministries globally. Every dollar will support the work of the Kingdom. Regardless of who wins, when you sow, the Kingdom wins. WHO WILL TAKE HOME THIS YEAR’S TROPHY? Your SDB congregation just have another week (until May 15th, 2018) to participate in this fundraising campaign. Funds received by the Society up to May 31st, 2018 will be counted.